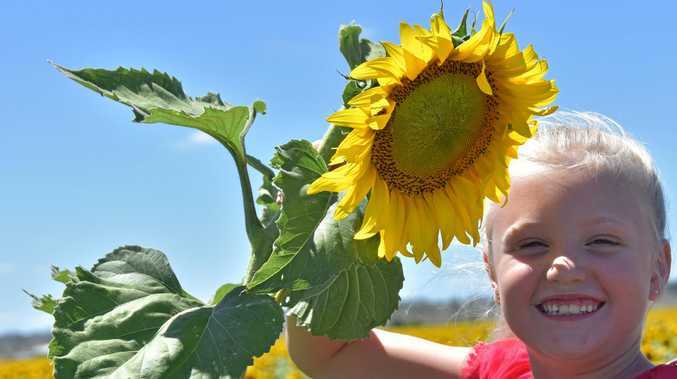 SUMMER is synonymous with sunflowers on the Southern Downs, and now is the time to snap one of the region's most blooming gorgeous sights. Sunflower fields are in full bloom across the region, and here are the four easiest to photograph spots that won't take you more than 15 minutes to get to from Warwick. Just remember, always park safely, drive slowly and be careful when stopping to take photos. Most of these fields are on major, extremely busy roads. Turn off onto Freestone Rd, and keep your eye out for yellow. These fields of sunflowers are on a slant making for an even more incredible spectacle, and photo opportunity. Chuck Freestone Creek Rd turnoff into your GPS and you'll be there in no time. Don't let the flood of flowers distract you from doing 60km/h. If anything, the blooming display should be one more excuse to slow down. On the southern side of the Eight Mile Intersection, there is a small parking patch where you can pull over and take a snap or two. The best things in life are always a little tricky to get to, and this field of sunflowers are true testament to that. Take Willett Rd (opposite Glengallan Homestead) and head west for a few minutes or so. First, you'll pass a massive field of corn, before spotting a nice yellow haze ahead. This is a fairly rough and tough dirt road, so if you're travelling with a low vehicle, drive slowly. 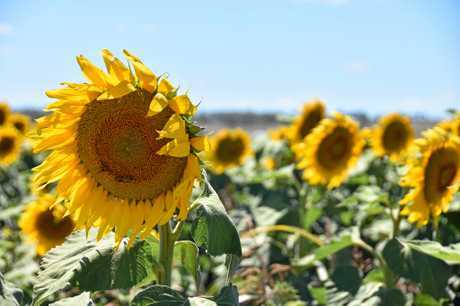 Take the road towards Brisbane at the Eight Mile Turnoff, and within minutes you'll find yourself faced with a field of blooming sunflowers. Be sure to be extra careful if you're stopping to take a photo of these flowers, as there are not a lot of parking spots to pullover at.